Are you sufficiently confused by the title? You’ll find no turtles in this post, that is more a reference to my current state of being. Severe back pain has currently forced me out of the kitchen onto my bed, where the only comfortable thing I can do without crying out in pain is to lie on my back, kind of like an over-turned turtle (at least that’s what my wife says I look like!). It’s been ongoing for three weeks now but suddenly got a heck of a lot worse on Thursday night, so by Friday morning, a trip to the doctor was in order. Fast-forward to today and here I lie. I can at least walk in a straight line now without collapsing onto the floor (yeah, I almost did that… luckily the cat tree was in the way for me to grapple onto) but it still hurts like hell to be in an upright position for more than a few minutes. Hopefully that too will pass and I’ll be up and about in no time. Moral of the story? Look after your backs people! I’m sure this all stems from when I used to work in a bar in England. My bar had borrowed a keg of beer from a neighbouring pub as we had run out of this particular brew and when we received our next delivery, we dutifully gave the other place a new keg. I say “we”… I meant “I”. I was responsible for lugging this heavy, metal barrel back, filled to the brim with lager. I rolled it out of our bar and down the road and all was going well. Then something happened. I was young, irresponsible; I saw a group of girls out for a night on the town. Somehow my idiotic man-child mind decided it was a good idea to pick up this keg – macho posturing at its finest. Well, I felt a twinge, I let out a little squeal, and soldiered on. I still feel twinges of pain to this day in that spot, and that’s exactly where the pain is now. Dear oh dear. Oh, and in case you’re wondering – no… the group of girls didn’t pay me the slightest bit of attention, nor were they even a little impressed by my keg bravado! Ok, so that’s the turtles out of the way. Now for the churros. Luckily I cooked these up last Monday, well before my back started going nuts on me! I’ve been wanting to make churros for absolutely ages but it’s one of these things that I’ve just never got around to. Inspired by the delicious post I saw by A_Boleyn I determined that I would make some as a pre-dinner snack for my wedding anniversary, on the 30th of July. As I’m new to the whole churros scene I decided to go for a simple recipe. I worked from this recipe at Taste.com.au which was, conveniently, in metric, and it worked very well. As I was making it I noticed that the dough preparation and ingredients are actually a lot like those for choux pastry which I never realised! A_Boleyn kindly recommended another recipe which had orange zest and juice in which sounded delicious. I’m going to try that next time – this time, the “regular” version was what I needed to break into this delicious snack which I’ve oft eaten but never prepared. I hope you all have a great Sunday, wherever you may be and whatever you may be doing. I’ll be back on Wednesday! Start off by bringing the water to the boil, in a large pan, with the butter inside. 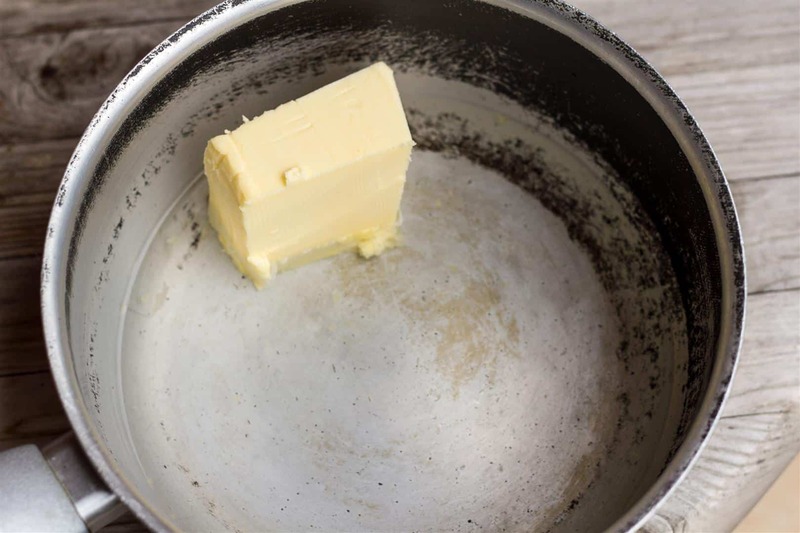 When the butter has completely dissolved into the water remove from the heat and then beat in the flour and salt to form a paste. 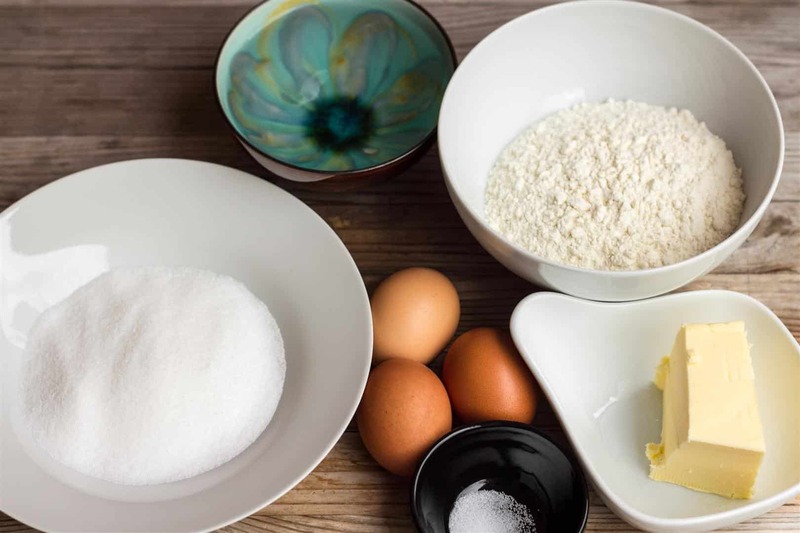 Beat the eggs lightly and then pour into the paste a bit at a time, mixing well between each addition until you have something resembling the photo below. Set the pan aside to cool for 10 – 15 minutes and meanwhile start heating the oil in a pan on the stove. I heated my oil to approximately 140-150 degrees Celsius with the aid of my Oil Thermometer – I found this a good temperature which yielded excellent results, although the original recipe called for a temperature of 180 degrees Celsius. 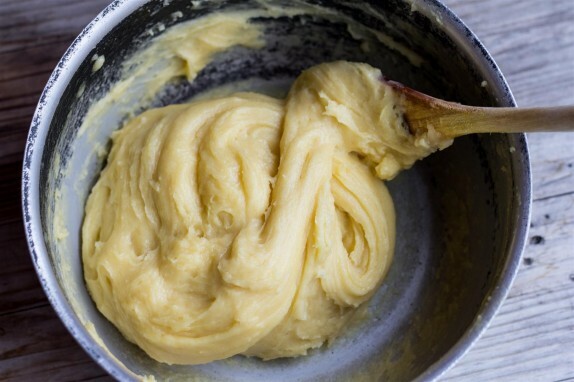 When the oil is at the desired temperature, spoon the dough into your Piping Bag or Gun and pipe directly into the hot oil, cutting off the lengths with a knife once they reach 8-10cm. Fry for a couple of minutes until the churros are a nice golden brown before removing with a slotted spoon and allowing to drain and cool slightly on kitchen paper. 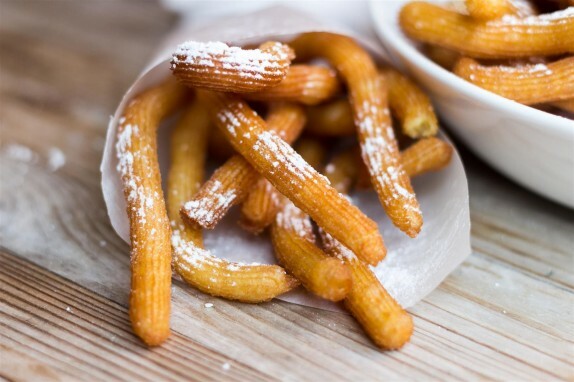 Roll the churros in caster sugar, or sprinkle with icing sugar, before serving with a dip of your choice. Enjoy! Hi Charles, Many, many sympathies for your back and although I did giggle at your up-turned turtle image, I know it is no laughing matter so I hope the improvement continues and you return to ‘normal’ soon... It’s funny but up until a couple of years ago I hadn’t really come across Churros but now quite often see them for sale at big outdoor events. The smell of them cooking draws people to the stands and they seem to sell very well. Last time I had them they came with a little cardboard pot of warm chocolate sauce to dip them in to-absolutely delicious! Thanks GD - I think it's important to keep a sense of humour... even when you're lying on your back like a turtle ;) Otherwise, one risks turning into an old cross-patch. I would frequently just start laughing in the middle of trying to hobble across the room because I found the state I was in so hilarious. Desperate but hilarious :D Churros are hugely popular these days. Chocolate sauce remains one of the favourite dipping sauces and for good reason too :D It's so yummy :D. Did you ever try to make them yourself? Never made them myself but now I have the recipe I am tempted to give them a try... Best of luck with the back though... ‘turtle’ is not a good shape to be in for very long! Hope your back is healing and you have returned to an upright position without any issue. I like how your churros curl, they have character. The name of this post made me laugh when I saw it in Google Reader but I am so sorry to hear about your back - that is no fun at all. 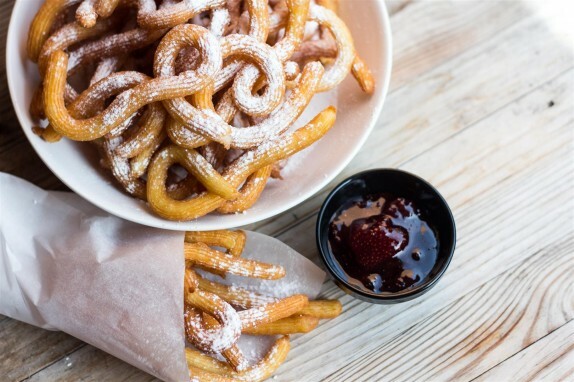 As for the churros, they look divine - love the idea of dipping them in strawberry jam! Thanks Laura - it's good to keep a sense of humour through suffering I think :). Glad you like the look of the churros - have you ever tried making them yourself? Hi Charlie, thanks for your kind comment. I didn't go to see any specialist yet. My back got a little better after my days off of being laid up, although it's started hurting a little again. I think the time may come when I have to go and see someone. Hopefully get this problem solved once and for all! Oh dear .... get well soon! The whole idea is to glug half the content of the keg before doing the Mr Atlas thing. That way, even if you popped something, you'd be too numb to feel it :) Anyway, now's the time to get pampered and fussed about. And take it easy. Those churros look great in all it's squiggly-ness.... kind of like curly fries. We have our own Chinese version of churros. They are a lot more doughy, not sweet but great dipped in coffee ... as these are as well. Hahaha, well that's true... definitely one way of lifting kegs. I guess one could argue that the amount you drink is directly related to the number of kegs you think you can lift! "10 beers? Sure, I can take 4 kegs no problem,... hic". 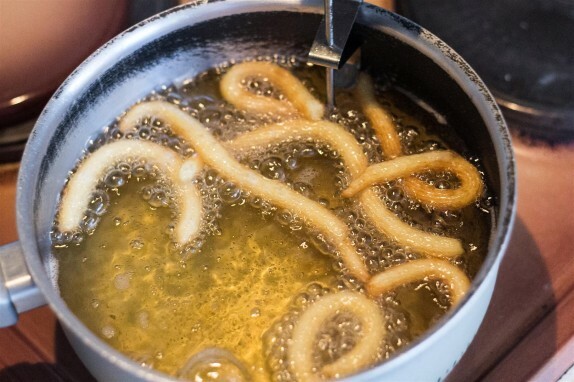 What is the name of the Chinese version of churros? I'd love to look them up! So sorry to hear about your back, Charles. Medication ... lots and lots of medication and rest are the answer so no more keg lifting for you. :) Your churros look great. I used the largest star tip I had which was probably the same size as yours and thought they churros were a good size. Congratulations to you both on your anniversary. Thanks A_ - I noticed this comment got classified as spam for some reason, so I rescued it :) I think your star tip might have been a bit bigger to be honest as yours did manage to look more "proper". Mine definitely look a bit small :) My back is feeling much better now - I'm mobile at least, although it still hurts in certain positions sadly. Lots of medication is indeed the answer, but I hate popping 12-13 pills a day. Sometimes the side-effects can be most unpleasant so I'm glad to be off them too! Thank you for 'rescuing' the comment. I saw that it had disappeared and that's why I reposted ... definitely wanted to comment. I certainly don't recommend 12-13 pills. That seems excessive. :) But I take them for my hip when I'm working. Half of one about 3 or 4 days a week if absolutely necessary as they're rough on my stomach. 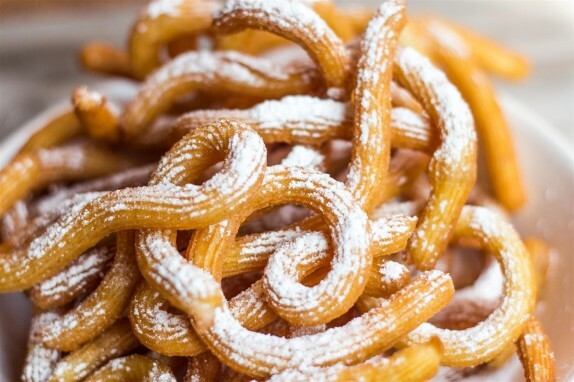 Now you´re making me homesick for Sunday morning churros in Spain :( Great post! Your churros look delicious, Charles. I hope your back mends soon -- I find that hours at the computer make mine tempermental so I try to force myself to take regular walks and not sit so long at a stretch. Sorry to read about your back pain. I hope you're feeling better! I've always wanted to make churros as well. These look delicious and have inspired me to get over the hump and just do it! They look so, so good! Hi Marina - I hope you don't suffer too much from back pain - I hope with some regular exercise and losing a bit of weight, hopefully I can make my problem go away for good :) As for the oil thermometer - no, it's not an absolute must, but I find it very useful. You can get them for very little... ~$5, and it's a great way of ensuring optimum oil temperature! How horrible, Charles, I've never had back pain but ive had debilitating shoulder pain so I can almost understand; I do hope you mend quickly. The churros look wonderful, although not a healthy snack sometimes it's just worth a splurge! I also like that they are curly. Charles, even though I'm not a fan of churros (in deep-fried sweet food I'm rather a doughnut fan ;-) I will post doughnuts soon I think), these look particularly luscious and I'm sure they are different from all the fatty, greasy stuff they sell on markets. Dipped in strawberry jam they must taste heavenly! I am really sorry for your back problem and hope you slowly recover from it. I cannot even imagine how difficult it must be. Yum...I love churros and your long squiggly ones look so crispy and good. Sorry about your back...I was having the same problem two weeks ago. Thankfully, I am back to normal and I hope you will be soon. Hi Charles, I really hope your back starts to feel better. I had no idea that churros are so easy to make. I love eating these and I am happy to find this recipe on your website. Please take care charles :( Have lots of rest and try not to overwork yourself anymore. The churros look divine, I love the pattern of their swirls, and never thought you could make your own just like that. Dipped into that strawberry jam, it must have been awesome! Anyway, hope to hear you up and about tmr! Thanks Shuhan - My back was getting better while I was laid up. Having been back at work I have to say it's getting a bit painful again, but I'll have to see how it goes! Charles, so sorry to hear about your back... backs are tricky business and it's so hard to know what may or may not set it off. I've found core strengthening (pilates/yoga) really helpful. Do take care of yourself and take the time you need to recover. Thinking of you... I've never tasted a churro but I think I would prefer this version over traditional donuts which I'm not very fond of. I especially like the idea of the dip to accompany. Very nice photos Charles! (you make them look so inviting enveloped in the paper - almost like french fries!!! :)). Thanks Kelly - I have to say I love donuts too, but churros are definitely a wonderful alternative. I'm going to have to look into some good exercise regimen to help strengthen my back and avoid further problems! I'd forgotten just how much I love churros until I saw your cute curly ones, Charles! And a version with orange, maybe some cinnamon and then dipped in chocolate...now I really want some! Take care of that back, and I'm so sorry you're having that trouble. We forget how precious our backs are until they start giving us trouble. I realize that I am way behind but Happy Anniversary to you and your wife. I will have to try churros, I have never had them before. Hope you back is better. I was intrigued by the title. I hope your back feels better now - it really is so important to look after your back. I Love churros and have never dared make my own as I don't like deep frying anything at home. Yours looks even better than the ones I normally buy at the market. Thanks Jenny - feeling much better now, thanks - at least I can walk now :) I hope you can get over your bad churros experience and give them a try. They're best when they're fresh. Hot and crispy! Sometimes a store near me sells them but they're always cooked in the morning and sold throughout the day so if you go in the afternoon you have something which is cold, soggy and not nice at all! Thankfully you have a wonderful wife to care for you! I'm sure these churros will have helped your recovery tremendously! !